← Friezland Lane Working Men’s Club: help needed! We all love it to bits, it’s as much Brownhills as Morris Miner, Poxon’s Butchers or Co-op corner. But few know how it came to be, and reader and top news-sleuth Peter ‘Pedro’ Cutler has found a classic story in the Lichfield Mercury of 1912. Students of local nomenclature will spot many local street names in the recording of dignitaries speeches, and also, that the familiar canard of councillors – that youth never get involved – is unchanged in a century. Similar dignified moaning can be found in the previous article regarding potholed roads of the time. For a wider picture of Brownhills during the period, check Dr. Maddaver’s statement on the health of Brownhills. Sad to see that we’ve apparently missed the centenary of the clock unmarked. I apologise for not spotting it. Cheers Peter. A classic article and great find. The unveiling of Brownhills’ biggest liar. Never knowingly on time… Picture from Walsall Council’s ‘A click in time’ website. The Lichfield Mercury recorded the installation of the Public Clock in the Public Buildings, at Brownhills on Thursday 21 November 1912. The clock had been purchased mainly by public subscriptions by the inhabitants of Brownhills and district, and had been erected over the principal door leading into the public buildings. It is of handsome appearance, with a 9 inch brass frame, with hardened steel pinions, hammered bearings, and a Graham dead beat escapement, and second quarter pendulum, driven by two weights weighing 3 and 1.5 hundredweights respectively. The pendulum ball weighs 60lbs, and the bell, which serves the double purpose of the fire alarm and clock bell, weighs two a half hundredweight. The dials are 3 feet in diameter, and it is only clock of its kind in the Midlands. The dials, of which there are three, one at each side and one in the front, are of opal and copper, with hands of copper. It is fixed to the wall by means of two brackets, weighing 1.5 hundredweights each. 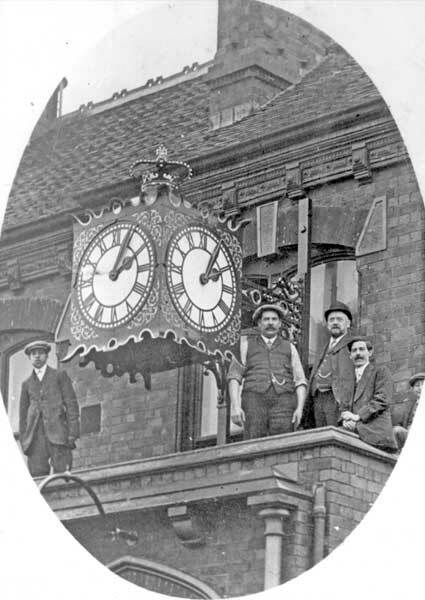 The starting of the clock was marked by a public ceremony, and a great deal of interest was taken in the event in Brownhills and district, and a large crowd assembled outside the Public Building to watch the starting of the clock. Mr JH Shaw, who formally started the clock, said that it gave him been great pleasure to see such a large attendance at the ceremony. The committee felt very grateful to the people for the interest located in the matter. This would be, he was sure, be a red letter day at Brownhills. It had double interest for him, for that day he had completed 25 years service amongst them. He was greatly indebted to them for the honour conferred upon him in allowing him to start the first public clock in Brownhills. He had much pleasure in formally presenting the clock to Mr G Hodgkins, the chairman of the Brownhills Urban District Council, who promised to maintain and keep it in good repair for the benefit of the people of Brownhills. 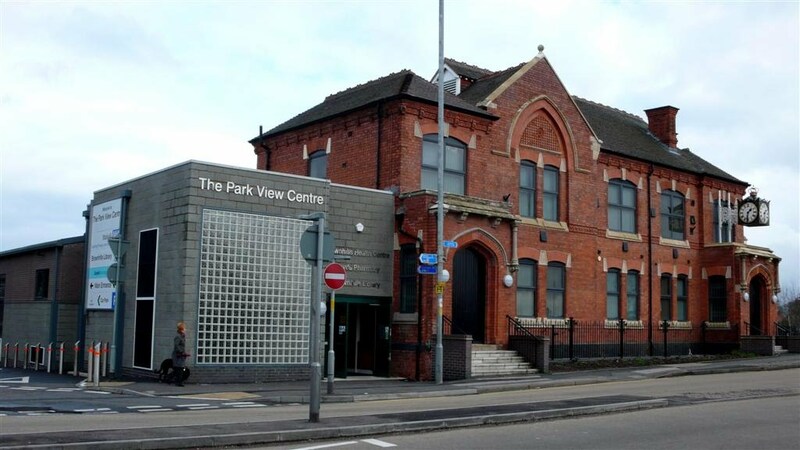 ‘Sore abused, but not yet dead’ – despite hideous extensions and architectural desecration, the Council House – now the Parkview Centre – maintained the clock, which steadfastly refuses to tell the correct time. Were it ever to do so, I think all life in Brownhills would cease. Mr Shaw then proceeded to start the clock a few minutes before 3 o’clock. As the hands arrived at the hour the clock commenced to chime in loud tones. Mr W Lunt spoke of what might be done in the future in endeavouring to get a public park, baths, a library and news room, and many other improvements for the good of the people of Brownhills…. Dr D Bradbury gave a statement of expenditure on the clock. The cost of the clock, he said, had been about £120… A list of subscriptions is given…. This entry was posted in Brownhills stuff, Environment, Events, Interesting photos, Local History, Local media, Local politics, News, Shared media, Shared memories, Spotted whilst browsing the web and tagged Brownhills, Brownhills local history, Civic Centre, Clock, Council House, Events, Lichfield, Local History, Mercury, New Photos, Parkview, Pedro, Peter Cutler, Redevelopment, Staffordshire, three faced liar, town hall. Bookmark the permalink. Well this is an interesting article, I have always been fascinated with the way clocks became a part of the landscape and history, and how clock and time have evolved to part a significant part of peoples lives. There are a number of criteria according to which the past can be divided up, not just to produce manageable chunks, but also to organise our thoughts about it. I think time is a complex concept, it is most rigorously analysed by philosophers, physicists and astronomers. My interest is history and the systematic study of the past, therefore at its heart is time. With my interest in history I try to take a practical viewpoint, and am interested in the effects of passing of time on human memory, and how we chunk our past up into manageable chunks, based on time, relationships and places and how we have used time as a device to create pegs to hang the past on. One final word, I discovered this clock a couple of years ago in Tirley Gloucestershire, a great example of ‘recycling time’ and a monument to a fascinating man. I love the “Three faced Liar” it reminds me that time, so far, is endless! a super article! Oh! to have been there ! Well done Pedro. And what a coincidence to see that both photos were taken at 11.35 ! Brilliant article yet again Bob, but when you look at one of the latest photos taken don’t you have to wonder how on earth that monstrosity of an extension has been added. I hope you have added to your annals of time capsule that the folk of Brownhills (hopefully) had nothing to do with its development (who actually did – do we know?). When compared to the beautiful old building supporting the clock this carbuncle looks really really out of place big time. I went to Brownhills Central Boys school opposite..as I didn’t have a wristwatch until my 13th birthday,the early days at the school were governed by the clock,it seemed to be ok then as I was never late as far as I can remember,I used to lie in bed and hear it chime,I still live in Brownhills,somewhat closer to it now but I haven;t heard it chime for a while so I assume its out of order again It was originally a fire bell for the fire station opposite but during the late 50’s was replaced by a ww2 siren which was on a gantry right by the playground,lessons had to stop if it went off,firemen would arrive on pushbikes,motorbikes or on foot,I think they were the voluntary ones.. The clock does keep decent time Ken and the bell still tolls, but not necessarily the correct number of times. I know some two faced liars in the area!